Regarding post about problems with remote monitoring here is some more help needed when cases described in this post fails. This solution will work even if your remote host is hidden behind firewall, NAT etc. Having SSH access to it is enough. You will need Putty and XMing. 3. Run XMing on local machine (standard configuration). It will start listening for X11 connections. 5. VisualVM should now appear in XMing window and it is ready to be used. Keep putty session opened while using XMing. On a production environment I came across few (mainly connection related) issues while trying to monitor glassfish application remotely with either JConsole or VisualVM. 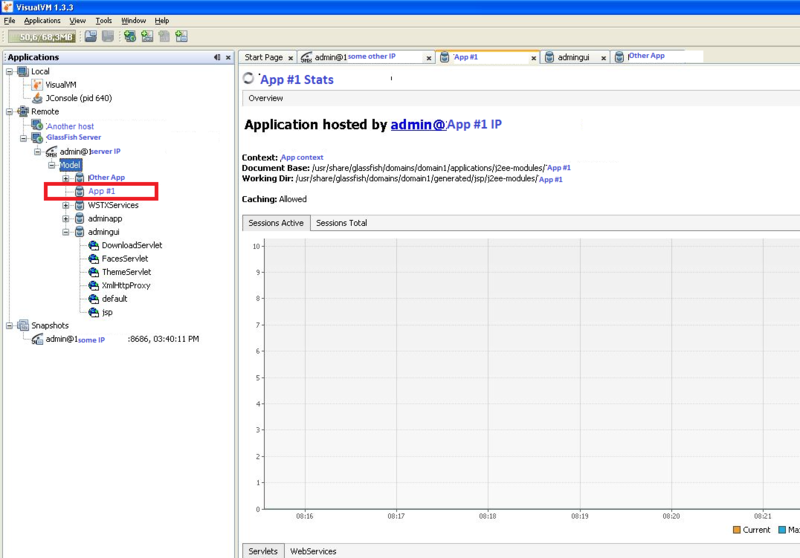 Tools does not differ in a connection method – problems were exactly the same and not caused by tools, but by glassfish setup, application statuses and firewall configuration. There is not very much of it. Just turn on Glassfish Monitoring using GUI. For HTTP Service and Web Container at least. LOW level is enough. 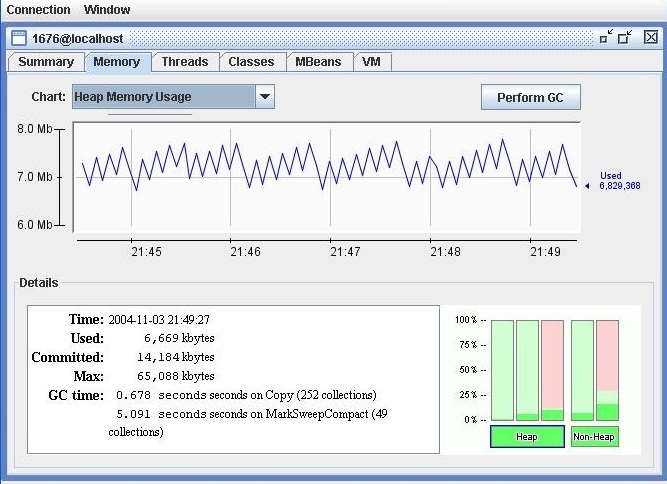 Set it in: Configuration -> Monitoring. Resolution: Only servlets with some statistics available are displayed. In order to generate statistics put some load on the web application. It appeared that App #1 was an older version of an existing App #2 (that is was not visible because of it). Removing App #1 by Glassfish admin GUI helped to resolve this conflict, and App #2 (the current version showed up and was able to be monitored. After setting up the Glassfish IP address and credentials the connection could not be established. I solved this issue by dedicated RMI configuration. It was necessary because of a NAT, I suppose. The result is that RMI receives packets from VisualVM, and then responses that it is listening on his local IP address (127.0.0.1). Then VisualVM is lost, because following requests are sent to given IP (127.0.0.1). And it works! Helpful sources: source 1 and source 2. This source states that the jstatd (daemon responsible for RMI) has to be running in order to be able to connect to GF using RMI. I have two hosts with similar configuration, and to the one of them I was able to connect, the other one – not. both of them did not have jstatd running. As it turned out later this was not the problem (my problem was RMI IP described in Problem 2). So info in this source may be outdated or maybe I’ve made some mistake in using it or it was simply not a case for me. Firewall can surely be a cause of Your problem. If You know that traffic is blocked – nothing will help. Then I advice You to try setting up Monitoring tool locally on Glassfish Server and connect using Xming. This is also a good solution. Do not hesitate to ask a question if You need more details! 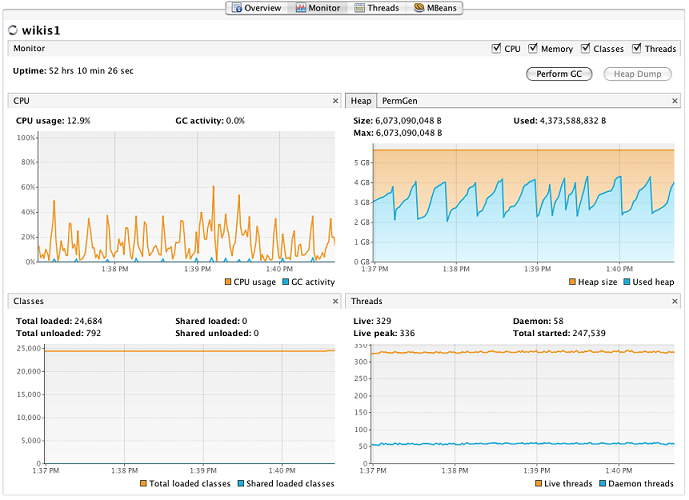 It is good practice to monitor server resources of your webapp. You can really know Your app better with monitoring tools. Not only webapps can be monitored of course. Recently I encountered some problems with glassfish webapp. I thought that it could be lack of server resources. Although problem was different – I’ve learnt to use some monitoring tools – very useful skill! JConsole is provided with JDK, so using it does not require installation. It is then good entry point – You can just fire it on localhost and check memory, CPU usage, active threads and classes. Good solution for standalone apps, and starting point for advanced monitoring of webapps. If You’ll find such need You should install VisualVM. list each servlet in your app and measure the time spent by server on processing it, error count, and hit count. It also allows to create snapshots of current monitoring graphs and statistics (it is not just screenshot, but fully usable graphs). JRockit is another useful suite – full version is paid but, as Oracle representant said, totally helpful and worth trying. Equipped with VisualVM I did not find a need to try anything more. Reading JRockit specifications it seems that tool can be your last help when everything else fails. Tools mentioned are very useful to find bottleneck of Your app, errors source etc. They do not require a lot of resources to run so You can just fire them and watch graphs. Very useful. Installing them is very easy. Some problems may appear while connecting with app remotely. I’ll describe solutions in the following post.